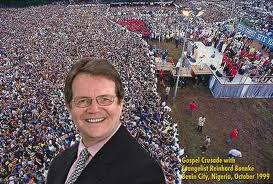 Reinhard Bonnke and Daniel Kolenda, Harvest Days Coming to America | Lift Jesus' Cross! Posted on August 29, 2013	by Lift the Cross of Jesus! When He went ashore, He saw a large crowd, and felt compassion for them and healed their sick (Matthew 14:14). I want to share with you a report from the harvest field of Tanzania, Africa. This report may sound unbelievable to western ears, but this is evangelism as normal in Africa. I am sharing this with you, again, because this glorious gospel is coming to America! I’m going to travel to Orlando, Florida, in a few weeks. I want to be there when Reinhard Bonnke and Daniel Kolenda preach the gospel in AMERICA and that 1st net for USA fish is cast out into the sea. May God bring many souls to Christ September 27th and 28th. If you can’t join us in Orlando, will you please pray for souls to be saved? 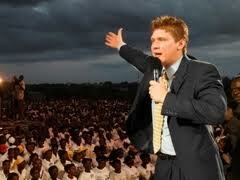 Tonight our Gospel Campaign came to a climax here in Dar Es Salaam, Tanzania. It has been an amazing week – the name of Jesus has been glorified, the sick have been healed, demons have been cast out, curses have been broken and thousands have been born again. Praise the Lord! This being Sunday, the participating churches have already gotten a taste of the fruit from this week. Pastors told us that their churches were overflowing with new converts today – in fact one of the pastors just told me that he had over 4,900 converts in his church alone this morning! Although the campaign has ended, the work is just beginning for the body of Christ here in Dar Es Salaam that will be following up and discipline these new converts. What a joy to work in these ripe harvest fields of the world. In addition to the hundreds of thousands who were present on the field this week, the meetings were broadcast LIVE on national radio and television. We heard that many people were healed in their homes and even in the hospital as they listened and watched the broadcast. One woman said that when she heard me pray on the radio last night she begin to tremble and a tumor that she had carried for 4 years fell out of her body! We thank God that we have been able to impact a city and a nation with the Gospel. I want to once again say Thank You to YOU – our family around the world that carries this work forward through your prayers and finances. You can’t imagine how much you are blessing many precious lives. We love you and thank God for each and every one of you. C. Hope, don’t miss any of the inspiring photos and my daily reports from Dar Es Salaam. Would you like to check out the details on the upcoming Orlando crusade? Click here! This entry was posted in Prepare for Emergencies, The Cross and the Christian and tagged Amway Stadium, Daniel Kolenda, evangelist, evangelize, Orlando, Reinhard Bonnke. Bookmark the permalink.